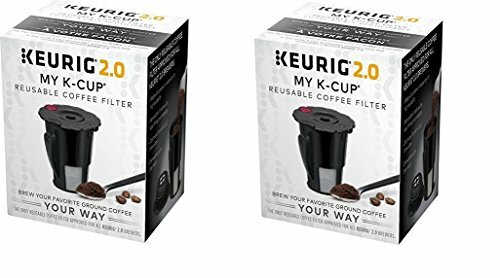 The Keurig 2.0 My K-Cup 2 Pack is a reusable and refillable pod that lets you brew any ground coffee in any model Keurig 2.0 Brewer. My K-Cup is constructed with premium materials for high durability and is top-rack dishwasher safe for everyday use. A dual filter design helps to prevent clogging and the filter cup is optimized for all K-Cup brew sizes. Measures approximately 2.38" l x 2.38" w x 2.5" h.